The relationship between periodontitis and two measures of systemic inflammation, serum albumin and C-reactive protein (CRP), were examined among patients who were receiving chronic outpatient hemodialysis. Adult patients at two locations, North Carolina and New York City, were evaluated by dentist examiners. Six sites per tooth (up to 32 teeth per patient) were examined. A periodontitis case was defined as ≥60% of sites with attachment level ≥4 mm. Multivariable logistic regression was used to determine the association of periodontitis with low serum albumin, defined as <3.5 mg/dl, and with high CRP, defined as >3.0 mg/dl. A total of 154 patients completed the study. The mean age was 54.6 yr (SD 13.3), and average duration of dialysis was 4.0 yr (3 mo to 16 yr). Eighty-six (54.6%) were men, and 89 (58.2%) were black. Common causes of end-stage kidney disease were hypertension (12.3%), diabetes (22.1%), glomerulonephritis (7.1%), and other (58.4%). The average number of teeth was 20.3 (SD 8.4). Thirty-five (23%) patients were periodontitis cases. Severe periodontitis was associated with low serum albumin (odds ratio 8.20; 95% confidence interval 1.61 to 41.82; P = 0.01) compared with individuals without severe periodontitis disease after adjustment for age, gender, race, diabetes, hypertension, body mass index, smoking, study site, total cholesterol, serum calcium, serum phosphorus, and normalized protein catabolic rate. There was no observed association of severe periodontitis with CRP. Investigation of the potential contribution of periodontitis to serum albumin and possibly to morbidity and mortality among patients with end-stage kidney disease seems warranted. Periodontitis is the result of the infection and interaction of selected bacterial species with components of the host immune response in disease-susceptible individuals. Clinically, periodontitis is characterized by the loss of connective tissue attachment that supports the dentition (cementum, periodontal ligament, and alveolar bone), and in humans the formation of periodontal pockets that are colonized with Gram-negative, facultative, or anaerobic bacterial species. An intense inflammatory cell infiltrate is recruited into the lesion that secretes proinflammatory mediators, including prostaglandin E2, IL-1, IL-6, and TNF-α. Studies have reported that moderate to severe periodontitis can precipitate an acute-phase response (1–3) and that effective periodontal therapy may be able to decrease systemic markers of inflammation (4). Inflammation is common among patients with chronic kidney disease (CKD) (5–8). Recent evidence suggests a high prevalence of periodontitis among individuals at early stages of CKD (9,10) and at end-stage kidney disease (11–16) (ESKD). Given the known proinflammatory effects of periodontal disease, we postulated that periodontitis may be associated with markers of inflammation in patients with CKD. We tested the association of periodontitis, a potentially modifiable source of inflammation, with serum albumin concentration and C-reactive protein (CRP) in a group of patients who were receiving regular outpatient hemodialysis. The study took place at outpatient hemodialysis units in central North Carolina and New York City. All patients who were receiving long-term outpatient treatment for at least 3 mo and able to give informed consent were eligible for the study. Patients were approached consecutively for possible participation in the study by two individuals (A.V.K. in North Carolina and M.Y. in New York). Patients were excluded from the dental evaluation if they were edentulous. After providing informed consent to a protocol reviewed and approval by the Committee on Research Involving Human Subjects at University of North Carolina School of Medicine and New York University, patients were scheduled for a dental evaluation. Trained and calibrated dentist examiners evaluated all patients who met inclusion criteria and had given informed consent. The examination took place during the hemodialysis session. All patients were given oral amoxicillin (2 g) or clindamycin (600 mg) 30 min before the examination. The dental examiners evaluated six sites per tooth (up to 32 teeth per patient) using standardized assessments of gingival recession (the linear distance in millimeters between the gingival margin and the cementoenamel junction); probing depth (the linear distance in millimeters from the gingival margin to the base of the periodontal pocket); the gingival index (a measure of inflammation of the gums around the tooth) (17); and bleeding on probing (the number of sites that bled after probing each site). Attachment level (AL), a measure of destructive periodontitis, is calculated as probing depth minus the gingival recession. Because of the high prevalence and extensive nature of periodontal disease among individuals with ESKD, periodontitis cases were defined as individuals with ≥60% of sites with AL ≥4 mm. This definition represents a substantial level of disease and in other populations would be considered severe disease. Patient demographic and medical information was abstracted from patient charts as well as by direct interview by two of the study authors (A.V.K. and M.Y.). Neither was aware of the periodontal disease status of the participants at the time of data abstraction. Age was determined in years at the date of the examination. Gender (male or female), race (black, white, or Asian), and smoking status (current, former, or never) were determined by self-report at the time of dental evaluation. Information on duration of dialysis and cause of ESKD was obtained from the Medicare 2720 form. Serum albumin was abstracted from patient charts; the assays all were performed at a central laboratory (SPECTRA) as part of the routine monthly laboratory assessments. The central laboratory uses the bromcresol green method for serum albumin determination. The date of the laboratory collection closest to the day of the dental evaluation was used to determine the value for the abstracted albumin. Serum CRP was determined by a high-sensitivity assay of blood that was drawn from participants on the day of the evaluation. The monthly laboratory assessments were not used because the high-sensitivity assay was not used routinely to determine the value of CRP. Low serum albumin was defined as serum albumin <3.5 mg/dl (18–20). Elevated CRP was defined as >3.0 mg/dl (21,22). Distributions of study variables were evaluated. Associations of study variables with periodontal disease case status were calculated as means for continuous variables and proportions for categorical variables. T tests and χ2 tests were used to test differences according to periodontal status for continuous and categorical variables, respectively. We ran logistic regression models with severe periodontitis as the independent variable and low serum albumin as the dependent variable. Noncases (participants without severe periodontal disease) were used as the referent group. Multivariable logistic regression included variables that we determined a priori from the literature to be necessary. Model 1 included age (continuous variable), gender (male/female), race (black/white/Hispanic/Asian/other), diabetes (yes/no), hypertension (yes/no), body mass index (BMI; continuous), smoking (current/former/never), and study site (North Carolina/New York). Model 2 included the variables in model 1 and normalized protein catabolic rate (nPCR), total cholesterol, serum calcium, and serum phosphorus. We also ran separate univariate and multivariable logistic regression models to test the association between periodontal disease and elevated CRP. We also calculated the power to detect a significant difference (α = 0.05) between cases and noncases for serum albumin and for CRP. A total of 154 participants completed the study. Figure 1 shows the distribution of AL ≥4 mm in the study group. Overall, the frequency of AL ≥4 mm was high. Figures 2 and 3 show the distribution of the serum albumin and CRP, respectively. The mean serum albumin for cases was 3.83 mg/dl (SD 0.41) and for noncases was 3.99 mg/dl (SD 0.53; P = 0.06). Mean CRP was 11.90 mg/dl (SD 17.50) among noncases and 9.27 mg/dl (SD 9.22) among cases (P = 0.28). Prevalence of attachment loss ≥4 mm in the study population. 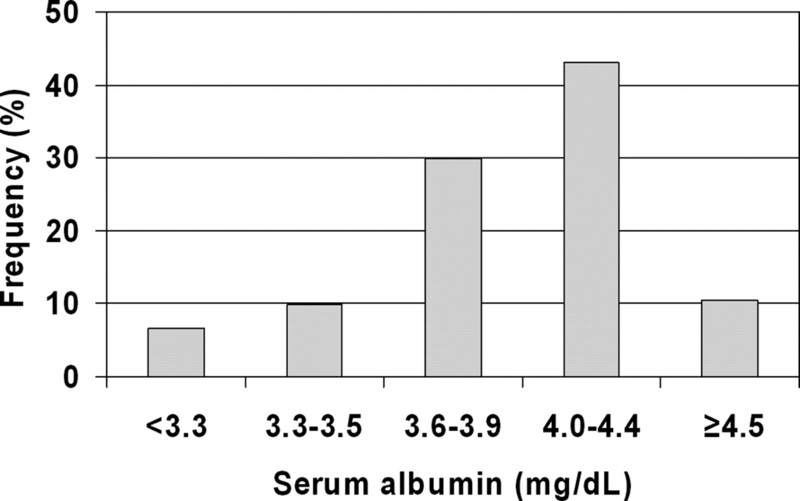 Categorical frequency of serum albumin in the study population. 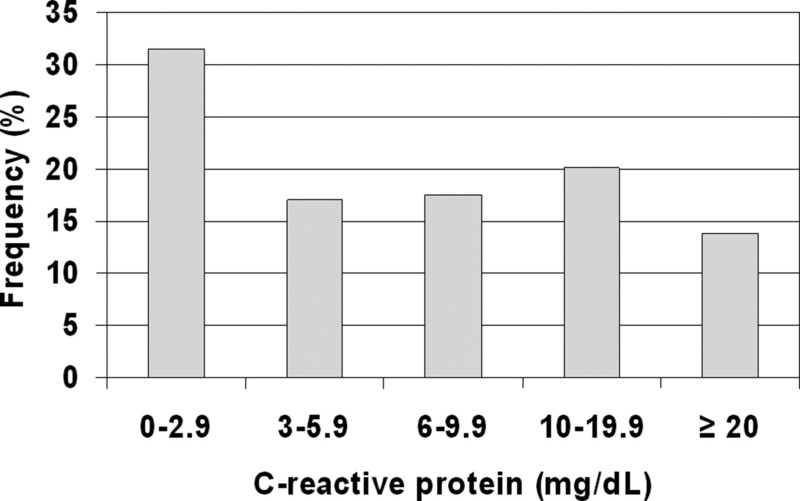 Categorical frequency of C-reactive protein in the study population. Demographic and medical characteristics of the study group are presented in Table 1. Study participants were on average in their sixth and seventh decades of life. Cases had a statistically significant difference in age, number of teeth, and PCR compared with noncases. There were no significant differences between cases and noncases in the other variables, including duration of dialysis, gender, race, smoking frequency, BMI, cause of ESKD, total cholesterol, calcium, and phosphorus. Periodontitis was associated with low serum albumin in univariate and multivariable models (Table 2). 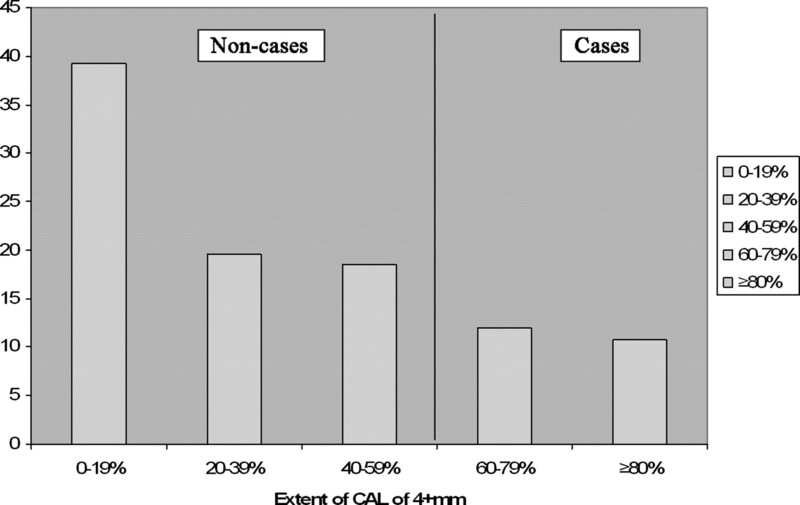 Cases were more than three times more likely to have low serum albumin than noncases (P = 0.02). After adjustment for study site, age, gender, race, diabetes, hypertension, BMI, and smoking (model 1), the odds ratio (OR) remained significant. Cases were more than four times more likely to have low serum albumin (P = 0.02). Adjustment for variables that were related primarily to advanced kidney disease, including nPCR, increased the strength of association (OR 8.20; 95% confidence interval [CI] 1.61 to 41.82; P = 0.01). CRP was not associated with periodontal disease in model 1 (OR 0.883; 95% CI 0.329 to 2.371; P = 0.80) or in model 2 (OR 0.593; 95% CI 0.168 to 2.093; P = 0.42). In this study of 154 adult hemodialysis patients, we observed that individuals with severe periodontal disease were more than three times more likely to have low serum albumin than individuals with less severe disease. After adjustment for demographic and medical characteristics, including smoking, hypertension, diabetes, age, gender, and others, the association remained strong and significant. We did not observe an association of severe periodontal disease with CRP. Periodontitis is a painless destructive chronic infection of the gums, ligaments, and bone that support the teeth. The space that is created by the recession of supporting bone becomes a site for bacteria–host interaction. The biofilm in the crevicular space contains clusters of bacterial species that are found commonly below the gingiva and are associated reproducibly with periodontal disease. These species predominantly are Gram-negative bacteria and include the generally accepted pathogens Porphymonas gingivalis, Tannerelli forsythia, Treponema denticola (a spirochete), and Actinobacillus actinomycetemcomitans (23). The number of bacteria range from 1 × 103 in healthy shallow crevices to more than 1 × 108 in periodontal pockets (24). These bacteria attract monocytes into the gingivocrevicular space, and numerous inflammatory cytokines are found within this space (3). Periodontal organisms, furthermore, are able to invade the host. Individuals with significant periodontitis have recurrent episodes of low-level bacteremia (25,26). Porphymonas gingivalis, one of the major periodontal pathogens, has been demonstrated to invade coronary and aortic endothelial cells (27,28). P. gingivalis, furthermore, can be harvested from atheromas in humans at autopsy (29,30), and, more recently, the organism has been demonstrated to be viable in the atheromas (31). Hepatic acute-phase reactants respond both to the secretion of local cytokines and to systemic bacteremia (3). Acute-phase proteins (app), defined as those whose plasma concentrations increase (positive app) or decrease (negative app) by at least 25% during an episode of inflammation, are measurable indicators of active inflammation (32). Although there are more than 30 different positive and negative app (3,33), serum albumin concentration long has held significance in the ESKD population. Serum albumin is one of the key indicators of dialysis quality (34). Hypoalbuminemia has been demonstrated to be a strong predictor of death (35,36). Although there is significant overlap with inflammation, starvation, and protein energy malnutrition, we do not believe that poor/reduced oral intake sufficiently explains the association. Starvation alone often is not enough to change serum markers such as serum albumin. In an oft-cited prospective 24-wk study of healthy volunteers who were subjected to semistarvation (1500 kcal/24 h), serum albumin decreased only moderately (4.2 to 3.9 g/dl) despite an average 23% reduction in body weight (69.3 to 53.6 kg) and muscle mass (37). We furthermore found that adjustment for nPCR did not eliminate the relationship between severe periodontitis and low albumin. Rather, the point estimate increased in value after the addition of nPCR. It is curious that we did not observe an association of CRP with periodontal disease. In the past decade, much attention has been focused on CRP as a prototypical marker of inflammation, and elevated levels of CRP are associated with mortality and cardiovascular disease in the CKD population (21,36,38). The lack of association that was seen in our study potentially may be explained by the following observations. First, the level of periodontal disease was high for the entire study group, and our case definition represents severe and extensive periodontal disease. We were forced to adopt this definition because the use of traditional definitions of periodontal disease would have resulted in almost all study participants’ being defined as cases. Although noncases had lower levels of disease, many noncases in this study would have been defined as cases by traditional definitions of periodontal disease. Therefore, noncases may have had enough disease to cause increases in CRP levels also. Second, in the presence of obesity, periodontal disease may not be sufficient to enhance background CRP levels. A previous study among individuals in the Atherosclerosis Risk in Communities (ARIC) study demonstrated that at low BMI, periodontal disease is associated with CRP; at BMI levels >30 kg/m2, the association is attenuated markedly (39). Obesity may elicit an inflammatory response (40). Our previous study among individuals with CKD also did not demonstrate an association of CRP with periodontal disease (10). Finally, the study may have been underpowered to demonstrate a difference in CRP between cases and noncases, with only a power of 5% for a two-sided 0.05 significance test and a power of 8% for one-sided 0.05 tests. Comparisons with the literature are limited. Recent reports demonstrate a high prevalence of inflammation (5,7,8) among individuals with ESKD. A notable recent study of hemodialysis patients in Taipei, Taiwan, demonstrated a similar relationship of periodontal disease and serum albumin (16). The key similarity to our study was that serum albumin concentration was inversely related to the severity of periodontal disease. Unlike our study, Chen et al. (16) demonstrated an association in univariate analysis of CRP to periodontal disease, yet the association was eliminated in multivariable models after adjustment for additional covariates. It remains possible that subtle differences exist in the two patient populations, one from regions in North America and the other from the Far East. Therefore, additional confirmatory studies are necessary. The study has some limitations. First, the cross-sectional study design prevents us from determining the exact nature of the observed association. Initial cross-sectional findings, such as ours, are based on current knowledge of the literature and are useful for generating hypotheses, yet the recent article by Chen et al. (16) strongly suggests that our results were not isolated findings. We acknowledge that the association could be due to uncontrolled confounding by socioeconomic factors or by other unmeasured conditions. Second, we relied on historical measures of periodontal disease, and not “active” measures. Future endeavors will be directed at measuring serum antibodies to periodontal organisms, as well as inflammatory cytokines (41). We have demonstrated a novel association of severe periodontal disease and low serum albumin in a group of patients who were receiving long-term outpatient hemodialysis. Given the known importance of serum albumin in predicting mortality and morbidity in the ESKD population, prospective cohort studies are warranted to confirm these findings. Speculatively, this study raises the possibility that dental intervention may affect beneficially the inflammatory burden in the ESKD population. This work was supported by grants RR-00046 (National Center for Research Resources) and DE-01379 (National Institute of Dental and Craniofacial Research) and the Renal Research Institute.